At Blake Landscapes, our dedication to servicing Loudoun and Fairfax counties is second to none. As a leader in snow risk management, our team of experienced snow professionals are on call 24/7 during any snowstorm and are quick to act during inclement weather. From shoveling sidewalks to clearing out entire parking lots, our services can benefit any business affected by a winter storm. We understand how critical timing is when it comes to clearing snow and ice from your property. We have the experience, training, knowledge and equipment to keep your commercial or residential site accessible and safe for residents and customers. Site conditions, timing, potential safety hazards, expectations and budget all play a vital role when considering your snow removal contractor. We pride ourselves on professional snow plowing done in a timely manner with impeccable safety practices. Our crews are trained to thoroughly service sidewalks, aprons, dock areas and dumpsters to keep them clear of snow through the winter. We maintain a fleet of snow blowers, snow brushes, bobcats and shovels to service your site, whatever the weather condition may be. Keeping areas with a high volume of foot traffic free of ice and snow is important to limit your liability exposure. Our sidewalk crews are trained to do the best quality job and provide proper ice melt applications in a timely fashion. We offer a full range of de-icing materials and services applicable to your properties’ needs to keep walkways and steps safe and accessible for the duration of the storm and beyond. Ice control involves a number of factors that include current ground temperature, salt mixture, timing and quantity. We utilize our best management practices to ensure proper application of any de-icing chemical or salt. We track incoming storms 48 hours prior to an event, alerting and preparing our team of snow fighters in advance to insure your property and parking lots will be clear and safe for your tenants and visitors. Keeping walkways and steps clear from ice and snow insures safe passage for both employees and visitors alike. We also schedule return visits when slow-moving storms continue to dump snow and freezing rain. 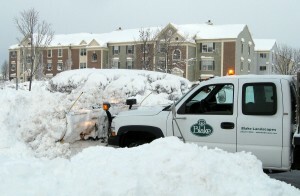 Blake Landscapes has the dependable staffing and best tools to clear snow from sidewalks. Armed with snow tractors and ATV’s mounted with plows, blowers and power sweepers, our crews get the job done in an efficient and timely manner. Blake Landscapes stockpiles more than 75 tons of bulk salt throughout the winter, which is replenished daily as usage warrants. Coupled with our large salt trucks, this allows us to keep you safe. 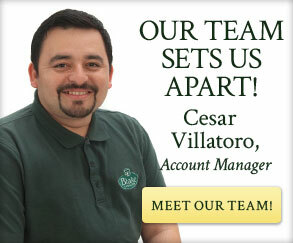 We also maintain accurate records of application rates and service times. If major storms occur in rapid succession, the snow pile causes driving hazards for visitors and costs your tenants lost revenues as parking spaces dwindle. Sometimes this means moving snow piles, or “stacking,” to widen out traffic lanes or clear prime parking space areas. Blake Landscapes maintains a fleet of front-end loaders ready to tackle any snow stacking projects. When stacking services are not enough, the snow must be removed from the site. At that point, it’s time for a snow haul. We maintain relationships in advance with contract haulers in the event that snow hauling is required.